I’ve started building a home lab and wanted to put up a quick post on a problem I had standing up my new Synology. I’ve been in presales for almost two years now, and not working with hardware every day really makes you rusty. That things that were once plainly obvious are just gone from memory. The Synology has 3.5″ drive bays, but I bought a couple of Transcend 2.5″ SSDs that were on the Synology HCL. The SSDs came with a mounting bracket and I spent a somewhat embarrassing amount of time trying to get the bracket to work. But I couldn’t get the holes to line up – no matter how I attached the drive to the tray, it wouldn’t fit into the Synology. 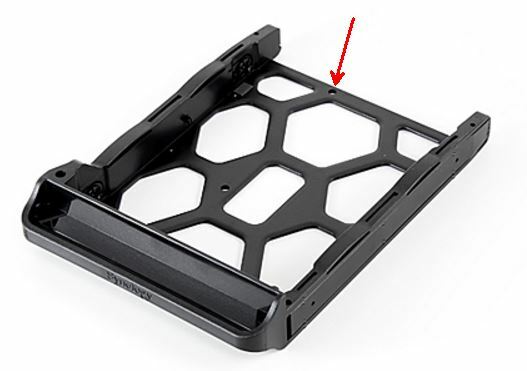 The solution was so obvious that there really wasn’t anything that I could find on Google – the drive trays already have mounting holes. Just screw the 2.5″ SSD directly into the drive tray. I felt a bit foolish but at least it’s working now! This entry was posted in Home Lab and tagged 2.5", drive, home, lab, synology by pkremer. Bookmark the permalink.